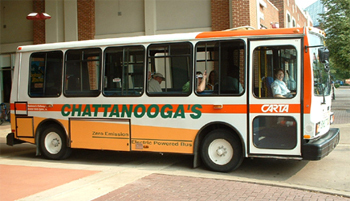 Chattanooga, Tennessee is one of the newest cities announcing the upgrade to smart buses. The Chattanooga Area Regional Transportation Authority (CARTA) will be implementing its “Smartbus program” which includes GPS bus tracking as well as free WiFi for riders. The payment system has will also be upgrade, and will allow riders to use credit cards and a new contactless proximity card that is being issued by CARTA to pay bus fares. The new technology is scheduled to begin being implemented in Spring 2008.